I mentioned a while back that I was looking at getting a new(er) car. Looking back, I’ve been wanting to get a bigger car since I was pregnant with Lucy and had to try to make room for two car seats. For a long time, I thought I wanted a mini-van. I know they’re uncool and boring, but whatever. All that space! But after test driving several and doing a ton of research, I decided that I really liked some of the 3-row crossover SUVs over the mini-vans. They felt easier to handle when I drove them. The problem is, a lot of the 3-row SUVs have teeny-tiny third row seats, which are ok for small kids, but not for bigger ones. I figured that since I’ve had my Subaru for 15 years, this next one would be my car at least until Lucy goes off to college. So whatever car I bought, I wanted one that would be able to haul my someday adult-size teenage children around. So, even though I liked the Toyota Highlander and the Kia Sorento, those got ruled out due to tiny third rows. I liked the Mazda CX-9 a lot, but Consumer Reports advises against them because they did horribly on their crash test scores. 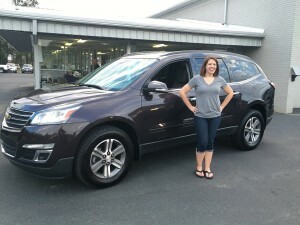 The one other car that I really liked was the Chevrolet Traverse. Which surprised me, because never in a million years did I think I’d buy an American car. My family only owns Hondas and Toyotas. But the Chevy Traverse got great reviews (so do its “sister” vehicles, the GMC Acadia and Buick Enclave – they’re all more or less the same car with different trims/features), and I really liked driving it. Side note: I surprised myself during this car buying process, when I learned that I’m really good at haggling. (“We have the best price for this vehicle.” “No you don’t, the exact same car is over at X dealership for $700 less than your price.” Or, they’d try to tell me how much a car was worth, and I’d be all, “Oh here, let me pull up Kelley Blue Book’s website on my phone and show you otherwise.”) I had brought Chris along with me, because I felt like I needed to have a man with me to negotiate, but then I ended up doing it all myself. At one point, some salesman had brought over his general manager to try to argue prices with me, and the GM kind of looked at Chris in desperation. Chris just shrugged and said, “Don’t look at me. It’s her money, she’s the one you have to deal with.” That was a weirdly empowering moment. It took a while to find the car that I liked, but I settled on a 2015 Traverse that we tracked down at a dealership in Johnston County. It had been owned by Enterprise and used as a rental car, so even though it’s only a year old, it already has 24K miles on it. I was hesitant about the idea of buying a car that had been a rental, but I talked to our mechanic, and he said that typically buying a rental is a pretty safe choice. As he pointed out, you can guarantee it was serviced regularly, and if there’d been any damage or issues, they would have had it fixed on their insurance, so it would’ve shown on the vehicle’s CarFax. That made me feel better. Plus the higher-than-average mileage brought the price of the car WAY down. Oh, and did I mention that it’s purple? They call the color “Sable Metallic,” and I guess it’s really more of a purple-y brown. But I love the color. PURPLE CAR. That night, after we got the new car home, I was happy about it – I mean, of course. I got the car I wanted, and I waited until the last day of the month and negotiated a really good price for it. But I’ve been saving up for a car for the last few years (I didn’t want to finance it), so I also had this sort of shaky, panicky feeling, like, “OMG my entire savings account is GONE!” But that savings account existed for the purpose of buying a car, so yeah, of course I drained it. Still, it was a weird mixed feeling. And honestly, I’m glad that Chris is keeping my Subaru and that I didn’t have to trade it in. I love that little car so much. It’s the first car I bought new, and I bought it by myself. I’m pretty sure that if you’d told me back then – when I was 25 years old and single – that I’d someday be driving that car with my 2 daughters in the backseat at age 40? I would’ve thought you were crazy. But it’s been a great car, so I’m happy that we’re keeping it around. Whenever we do have to trade it in or replace it, I’ll probably cry. Both of the girls love the new car. The middle row is 2 captain’s chairs, so they have space between them. (No more fights about, “She’s in my space!”, “She’s touching my side!”, etc.) Lucy actually prefers to have her car seat in the third row so she can have it all to herself. She also likes to announce, “I’m riding in Mommy’s trunk!” Which is probably going to lead to an awkward conversation with daycare at some point. I suppose people buy cars all the time and it isn’t really a big deal in the grand scheme of things. But since I’m apparently the type of person who only buys a car every other decade or so, it feels like a pretty big life milestone to me. 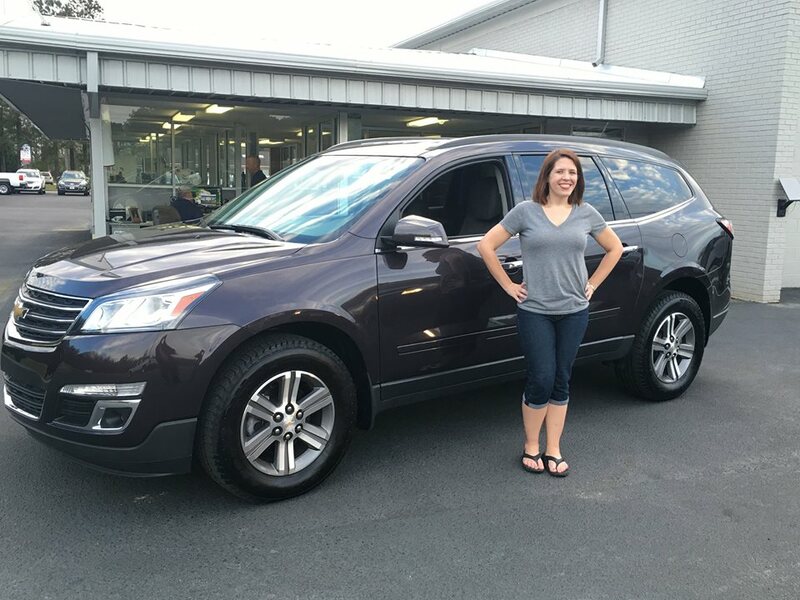 This entry was posted in Shopping and tagged car shopping, Chevrolet Traverse, Subaru Outback Sport by Cindy. Bookmark the permalink. We changed our car before Christmas and, like you, didn’t want finance. Although our ‘new’ (6 years old, 63k on the clock) was ‘only’ £3000, handing over that cash that had taken ages to put aside solely for a car was painful and very stressful and worried me something rotten. I do love my new car though (my husband doesn’t drive so it’s mine 😆). Happy driving – I love your purple car!